"A Stroll Along the Sea of Galilee - New Life for Your Daily Devotions"
You also get free access to hundreds of articles from CWGministries.org and a free subscription to my unique and inspirational newsletter God's Voice Worldwide! You can unsubscribe any time and I guarantee your email privacy. Pull up this video on your player or listen to it on your iPod during your morning devotional time and let us paint a scene of you and Jesus walking together along the Sea of Galilee. We'll encourage you to ask Him one of the following questions, "Lord, what would You like to say to me?" "How do You see me?" or "Do You love me?" We then guide you into using the four keys for hearing God's voice, which are: quieting yourself down, fixing your eyes on Jesus, tuning to spontaneity and writing. After the 5-minute quieting exercise, where you are taken for a stroll with Jesus along the Sea of Galilee, there follows 25 minutes of anointed music playing softly in the background which is ideal music to journal by (composed by Julie True). The format of this Stroll Along the Sea of Galilee makes these daily conversations with Jesus easy and effortless. It is designed to lead you directly and immediately into the experience of hearing God's voice and seeing vision. It also makes an ideal gift to give to your friends to introduce them to experiencing God's voice during their devotional times. 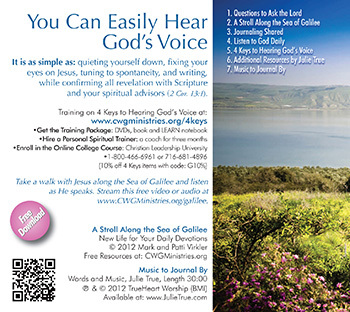 People are leading entire groups into hearing God's voice simply by popping this Stroll Along the Sea of Galilee into a CD or DVD player and letting them listen for five minutes. They are taken on a beautiful walk with Jesus and then led into journaling with anointed music in the background. IT WORKS! After journaling, volunteers read their journaling to the group and they will often do so with tears streaming down their faces. This provides the quickest way we have discovered to bring a group into hearing God's voice. Everyone hears God's voice in only five minutes! This tool leads them directly into an encournter with God. Discover as King David did, that anointed music precipitates the presence of the Holy Spirit (2 Chron. 5:13). This will not only greatly enhance your quiet times, but these products are wonderful, inexpensive items to purchase and give to friends whom you would like to introduce to two-way journaling simply and immediately. It leads them directly into an encounter with God, and then later explores the training resources which will teach them how to have this living encounter every single day of their lives, and share it with others. Since I have been listening to Julie True's music while journaling, it is amazing how the anointed music is reaching right into my soul. Never have I experienced anything like this before! This is a new place to be in! Since I have been using the soaking music for journaling, my journaling has changed. I am seeing more vision and a whole new experience is taking place! Once upon a time, God walked and talked with Adam and Eve in the Garden of Eden in the cool of the day. Many years later, Jesus ministered to the multitudes along the Sea of Galilee, doing only what He heard and saw His Father doing. One of Jesus’ declarations was, “My sheep hear My voice.” So, we invite you to take a walk with Jesus along the Sea of Galilee and hear His voice. His creativity and guidance adds blessing to everything one puts their hand to (Deut. 28)! How about sending out an email to your mailing list? 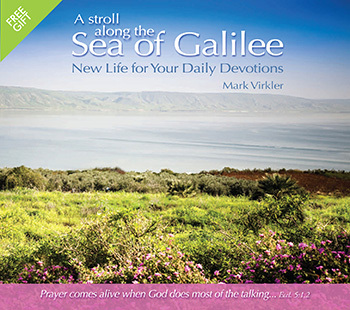 Check out this amazing new product: "A Stroll Along the Sea of Galilee" - New Life for Your Daily Devotions - It is available for free downloading here! ... Or you could copy and paste this article into an email and send it out to your friends. Tweet this out to all your followers! "A Stroll Along the Sea of Galilee" - New Life for Your Daily Devotions - Free download here! "God speaks and all can hear His voice!"